Security – We understand if you cannot have the RV parked in your driveway or garage, you want to know it is safe. Our warehouse is fully equipped with alarms and we utilize a 32-camera video surveillance system. We recognize that RVs are more susceptible to vandalism and theft when parked in neighborhoods. Our customers always appreciate indoor storage for their investments. Reliability – We are open every day of the week, providing access to your RV when you need it the most. We know family vacations can be planned or spontaneous. Either way, we can help you ensure your vehicle will be ready for the trip. Convenience – We offer several amenities to RV owners including an on-site icemaker, commercial air compressor, battery charger, and sewage waste dump sites. Having all of these conveniences available can ensure your vacation starts as smoothly as possible. Protection – Storing your RV indoors protects it from the elements. Regardless of the season, you do not have to worry about sun, wind, or rain damage. You RV will remain in tiptop condition from the time your park it to the moment you drive away from our facility. Are you looking for an RV storage facility that can provide peace of mind throughout the year? Look no further. 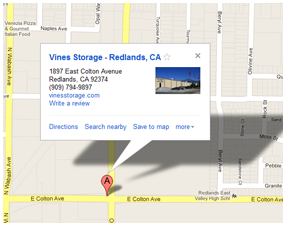 We proudly serve customers in the Redlands area and beyond. Call 909-389-6209 today.